Just did a garage clean-out this weekend. Selling the last misc parts from my 2004 RX-8. All available for pick-up in central Jersey. I have a set of the all weather floor mats in great shape. $55 + shipping for the set of 4. 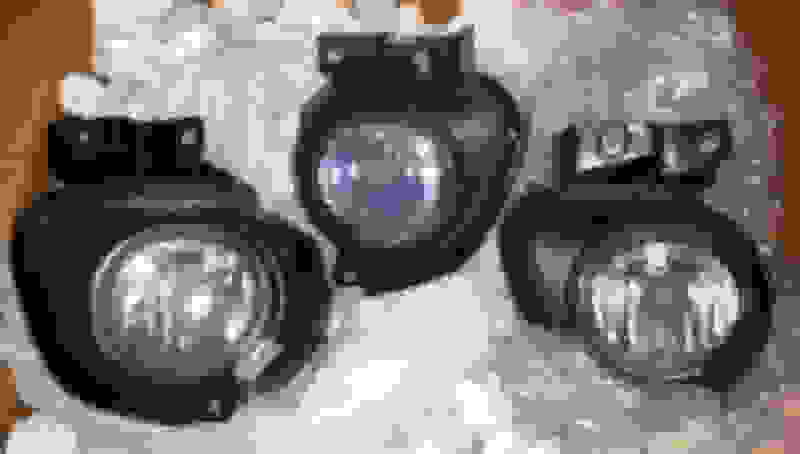 I have three OEM fog lights. See picture below. Mazda Instant Mobility System. See picture below. New in box Winning Blue rear mud guards. Never installed. - $20 shipped. I have a pristine set of carpet floor mats, great way to refresh your RX-8 if yours are worn. ProClip Angled Mount (Item 853302) base for console near the 12V lighter. ProClip iPhone 6/7 PLUS device holder Adjustable Holder (to accommodate case, Item 511667). Two 18" Raptor tires with most of their tread life. Will add size and tread depth in inches. PM to discuss price. I will update this post as I sift through the garage for other parts that are laying around. Last edited by fixitall; 09-11-2017 at 02:34 PM. Reason: Remove sold items. Bump for local New Jersey and Philadelphia residents. No shipping cost if we can meet. I need a rim - I live in wilmington de - first come for minimal rash? Bump; after a long winter absence from the forum I'm interested to sell the rims and remaining parts. Summer bump for Philly and NJ RX-8 drivers. I can meet moderately far north or south in NJ. Last edited by fixitall; 08-12-2017 at 09:41 PM. I found this box in the garage too. Two good fog lights and one that has a broken seal. I can re-pack these in the box and deliver for $45, shipping included. PM for close-ups and details on the lights. Didn't realize the two passenger lights have broken plastic housings. I can drop to $40 shipped for the set of 3 if they're useful to you for just the core of the light. The all weather floor mats are just laying around in my office at work. I'm willing to drop to $50 flat for a local pick-up in central NJ.